The above quote is based on the assumptions made in this version of the booklet. It now appears the rate of radioactive carbon formation is lower than was initially thought, and these figures are being reassessed. The new version will be released when this work is completed. Radiocarbon dating is frequently used to date ancient human settlements or tools. These dates are often claimed to be very precise. But how accurate is radiocarbon dating? How does radioactive carbon dating work? What are its limitations? What effect would the declining strength of the earth’s magnetic field and a catastrophic worldwide flood have on radiocarbon dates? 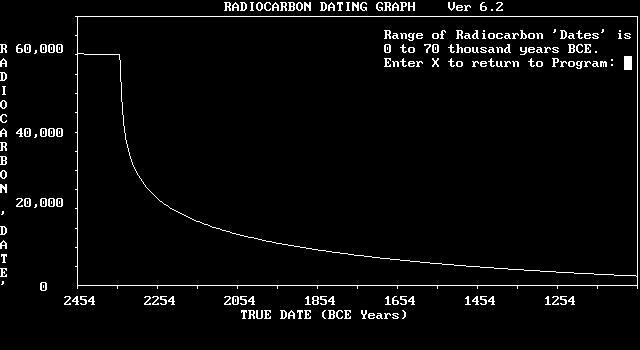 Radiocarbon dating compares the amount of normal carbon with the amount of radioactive carbon in a sample. The normal carbon atom has six protons and six neutrons in its nucleus, giving a total atomic mass of 12. It is a stable atom that will not change its atomic mass under normal circumstances. The radioactive carbon has six protons and eight neutrons in its nucleus, giving it a total atomic mass of 14. This atom is not stable, and will break down, releasing nuclear energy in the process. Radioactive carbon (Carbon 14) is formed in the upper atmosphere as a byproduct of cosmic radiation. Cosmic rays are positively charged atoms moving at enormous speeds. When they strike ordinary atoms in the upper atmosphere, the cosmic rays smash them apart. Some fragments produced in this way are neutrons. Some of these neutrons then collide with nitrogen atoms. This collision is less destructive than the initial collision that produced them. Usually a proton is knocked out of the nitrogen atom’s nucleus and is replaced with the neutron. The proton takes an electron with it and becomes an atom of hydrogen. The nitrogen atom, which began with seven protons and seven neutrons, is left with only six protons and eight neutrons. As the number of protons decides the chemical nature of an atom, the atom now behaves like a carbon atom. However, because it has too many neutrons for the number of protons it contains, it is not a stable atom. Every 5,730 years, approximately half of this radioactive carbon spontaneously converts itself back into nitrogen by emitting an electron from a neutron. As you might guess, radioactive carbon (C14) is quite rare. Only one out of every trillion carbon atoms is C14. However, it is present in all living organisms. The C14 created in the upper atmosphere reacts with oxygen to become carbon dioxide. The carbon dioxide is absorbed by plants, and the plants are eaten by animals, thus contaminating every living thing on earth with radioactive carbon. Once an organism dies, it stops absorbing C14. As time passes, the C14 in its tissues is converted back into nitrogen. If we know what the original ratios of C14 to C12 were in the organism when it died, and if we know that the sample has not been contaminated by contact with other carbon since its death, we should be able to calculate when it died by its C14 to C12 ratio. But in actual practice, we know neither the original ratios nor if the specimen has been contaminated and are forced to make what we hope are reasonable assumptions. The tiny initial amount of C14, the relatively rapid rate of decay (the half-life of C14 is currently about 5700 years) and the ease with which samples can become contaminated make radiocarbon dating results for samples “older” than about 50,000 years effectively meaningless. This limit is currently accepted by nearly all radiocarbon dating practitioners. It follows that the older a date is, even within this ‘limit’, the greater are the doubts about the date’s accuracy. During the last 30 years, a new method of determining C14/C12 ratios has been developed. It uses accelerator mass spectrometry to determine the amounts of C14 and C12 in a small sample which is vaporised in the test. The ions produced are forced into a magnetic field where the different mass of the carbon isotopes causes a different deflection, allowing the quantity of each isotope to be measured. This method is claimed to be more accurate than the older and slower method of counting the number of radioactive decay emissions from a quite large sample. It is the supposed accuracy of the new method that allows measurements sensitive enough to date objects claimed to be more than twenty or thirty thousand years old. A recent test by the British Science and Engineering Research Council has shown that the accuracy of the new technique is greatly overrated. They found large variations in the radiocarbon ‘dates’ of objects of known age sent to 38 radiocarbon ‘dating’ laboratories around the world. Thirty-one of the labs gave results that the British group called unsatisfactory. Their results were ‘two to three times less accurate than implied by the range of error they stated.’ They thought the variations might have been caused by poor laboratory standards allowing contamination of the samples. Radiocarbon dating has somehow avoided collapse onto its own battered foundation, and now lurches onward with feigned consistency. The implications of pervasive contamination and ancient variations in carbon-14 levels are steadfastly ignored by those who base their argument upon the dates. ...[Some authors have said] they were “not aware of a single significant disagreement” on any sample that had been dated at different labs. Such enthusiasts continue to claim, incredible though it may seem, that “no gross discrepancies are apparent“. Surely 15,000 years of difference on a single block of soil is indeed a gross discrepancy! And how could the excessive disagreement between the labs be called insignificant, when it has been the basis for the reappraisal of the standard error associated with each and every date in existence? Though there is a general trend towards older objects having less C14 in them than younger objects, clearly there are serious problems in converting the C14/C12 ratios into precise dates. However, there are other sources of error which make the dating problems even worse. I believe that the C14/C12 ratios in the past were drastically altered by three powerful factors. These factors are changes in the strength of the Earth’s magnetic field; changes in the total amount of normal carbon available to organisms and changes in the structure of the atmosphere. Changes which cause lower initial quantities of C14 and higher levels of C12 mean that radiocarbon date calculations which assume constant conditions in the past give falsely “old” dates. A major force altering the formation rate of C14 is the earth’s magnetic field. This field has a dramatic effect on cosmic radiation heading towards the earth. The magnetic field works like a huge bumper-bar. When the radiation strikes the field, it is bent towards the earth’s polar regions. Some radiation is deflected so much that it totally misses the earth. Much of the remaining radiation is channelled into the relatively unoccupied polar regions. As the magnetic field extends far beyond the earth’s atmosphere, some cosmic radiation never gets a chance to produce C14. Increasing the strength of the magnetic field will increase the shielding effect, reducing the amount of C14 produced. It is an accepted fact that the measurements of the Earth’s magnetic field strength show that the field is rapidly growing weaker. Professor Thomas G. Barnes, who has studied the earth’s magnetic field, says that the magnetic field is declining in strength exponentially. Prof. Barnes, who has developed the earlier work of Horace Lamb, demonstrates mathematically that the observed exponential decline in the strength of the earth’s magnetic field is exactly what one would expect if the earth’s magnetic field is generated by an enormous electric current flowing in the earth’s iron core. The decline is due to a continuous loss of electrical energy caused by electrical resistance in the core. If this type of decline has been occurring in the past, the field loses half of its strength every 1400 years. Scientific research suggests that an increase in the earth’s magnetic field to 100 times its present strength would result in complete shielding from cosmic radiation. As a crude approximation, I have accordingly allowed a 1% decrease in C14 formation for each doubling of the current field strength in the calculations of radiocarbon dates. As Table 1 shows, the effect of the magnetic field increase does not become large until times earlier than Noah’s Flood. However, as we go even further back in time, the effect of the magnetic field becomes staggering. The field strengths for dates as recent as 20,000 BCE are so intense that the electric current required to produce such a field would destroy the earth’s core. Barnes estimates that the heating effect of the current required would be about 250 million times what it is today. Unless one is prepared to believe that the magnetic field in the past was stable - an idea that conflicts with all the direct observational evidence - one must accept that the earth is young, very young. The rapid decline of the earth’s magnetic field makes a recent beginning point for the field (and thus the earth) a necessity. The increased magnetic shielding of the earth’s surface would also make life easier than it is today. This would result from the reduction in incoming radiation, which would make radiation-induced cancers and mutations rarer than they are today. TABLE 1 Effect of increasing Earth’s magnetic field on Carbon 14 production in the upper atmosphere. Using current rates of change for the Earth’s Magnetic Field, less than 10,000 years ago the field would have been strong enough to have totally stopped the formation of radioactive carbon. The world wide Flood which occurred in the days of Noah (Genesis chapters 6 to 8) buried nearly all of the organisms which had lived on the earth before the Flood. The burial of these organisms also meant the burial of the carbon that they contained, leading to formation of our coal, oil and natural gas deposits. As the rate of C14 formation is independent from the levels of normal carbon, the drop in available C12 would not have reduced the rate of C14 production. Even if the rate of C14 formation had not increased after the Flood, there would have been a fundamental shift in the ratio towards a relatively higher radiocarbon content. The amount of C14 present in the pre-flood environment is also limited by the relatively short time (less than 1700 years) which had elapsed between Creation and the Flood. Even if one is generous and allows for the current rate of C14 production to have ocurred throughout this period, the maximum amount of C14 in existence then is less than a fourth of the amount present today. As various estimates place the volume of C12 biologically available before the flood at 40 to 170 times it’s present volume, this suggests a maximum pre-Flood C14/C12 ratio of 1/160 to 1/680 of the current ratios. The last 150 years have seen this effect occur in reverse. Our massive consumption of fossil fuels is releasing the carbon which has been locked up in the Earth’s crust for the last four or five millennia. This carbon is virtually pure C12 and has been decreasing the C14/C12 ratio. The effect has been complicated by the addition of manmade radioactive carbon to the biosphere because of nuclear explosions and experimentation. And God said, Let there be a space in the midst of the waters, and let it divide the waters from the waters. And God made the space, and divided the waters which [were] under the space from the waters which [were] above the space: and it was so. And God called the space Heaven. And there was evening and there was morning - Day Two. The water vapour layer had many significant effects. It increased atmospheric pressure, making absorption of oxygen by living creatures a much easier process than it is today. The increased pressure and the presence of a huge quantity of atmospheric water vapour kept the humidity high, thus encouraging lush plant growth.1 The water vapour layer also had a greenhouse effect on the climate, both trapping and distributing the warmth more uniformly than it is today. Warm, moist conditions allowed the growth of “tropical” species in areas that are temperate today and the growth of “temperate” species in polar regions. The water vapour layer was responsible for the fossilised forests found in Antarctica today. The surface of the earth was also shielded from the effects of ultraviolet radiation by the water vapour layer, another factor making life easier in the past. All of these effects reduced environmental stress on living creatures, thus allowing larger species to flourish. The water vapour canopy and the strengthened magnetic field would also have reduced the number of damaging mutations to a rarity. These effects would have contributed significantly to the long life spans the Bible gives the Pre-Flood humans. Significantly, the water vapour layer also had an effect on the formation of C14. As Carbon 14 is formed by neutrons produced from cosmic radiation striking nitrogen atoms in the upper atmosphere, the thick layer of almost pure water molecules above our ‘normal’ upper atmosphere absorbed many neutrons before they could reach the atmospheric nitrogen. This greatly decreased the amount of C14 being produced. The water vapour canopy was one source of the rain during the Great Flood. The event that triggered the massive geothermal upheaval during Noah’s life also made the water vapour canopy unstable.2 (See Genesis chapters 6 to 8 for the reason for the Flood and details of this event that reshaped the earth’s crust.) Over a period of forty days the water vapour layer was totally destroyed. This would have allowed production of C14 to immediately increase enormously. The total effect that the water vapour canopy, magnetic field and the changes in the available mass of C12 might have on the C14/C12 ratios and thus on radiocarbon dating are shown in the Radioactive Carbon Dating Table and the Radiocarbon Date Graph. The graph plots the true date against the radiocarbon ‘date’. As we go farther back in time, the difference between the two dating systems becomes greater. The graph shows a relatively smooth variation before 2348 BCE, the probable year of the Great Flood. After the Flood, there is a steady increase in the production rate of carbon 14. This, coupled to the removal of most of the Carbon 12, results in a sharp decrease in the difference between the actual dates and the radiocarbon dates. In the hundred-year period from 2350 BCE to 2250 BCE, the difference between the two dates shrinks from 61,600 years to 17,900 years. The Radiocarbon Date Table (Appendix I) shows the effect more clearly. Though the atmospheric changes are quite dramatic, these changes were only slowly incorporated into the massive amount of almost pure common carbon found in the Biosphere.4 Thus there would be a fairly long delay in reaching the point where the C14/C12 ratios in the organisms would exactly match the atmospheric ratios. This scenario would also explain the age gradient seen in sedimentary rock strata. If the accelerated decay rate lasted the entire 150 days that the Ark was afloat (when the water would provide effective shielding for its occupants), it would cover the most active phase of sedimentation during the Flood. If such accelerated decay actually occurred, it is probable that whatever C14 had existed before that time would have been converted back into nitrogen. The way that trees form heartwood as they grow allows them to preserve a biological record of the C14/C12 ratios. Sapwood layers (the living xylem and phloem) are the tree’s transportation system. Xylem carries the supply of water and minerals that the roots extract from the soil up to the leaves. Leaves absorb carbon dioxide and oxygen from the air and combine them with the minerals and water from the roots. With the added input of energy from the sun, the leaves create a variety of sugars and other organic compounds that the tree requires. The phloem layer, just inside the bark, carries this food to the rest of the tree. As the tree grows, the inner layers of xylem are sealed up and die, forming heartwood. New sapwood layers form each year to replace the ‘lost’ sapwood. We will look at the radiocarbon ‘dates’ that would result from samples taken from different parts of a tree that began growing in 2345 BCE (BC), possibly three years after the Flood. Let’s assume that the tree grew for 250 years, when it blew down and the tree was used by people for firewood and building materials. A beam split from heartwood formed in 2105 BCE (near the outside of the tree) would have a radiocarbon date of 14,950 BCE. Another beam cut from heartwood formed in 2220 BCE (halfway to the centre of the trunk) would have a radiocarbon date of 20,190 BCE. A final beam split out of the centre of the tree, made of heartwood that had formed in 2335 BCE, would give a radiocarbon date of 39,610 BCE. The beams made from this one tree would give a range of radiocarbon ‘dates’ from 14,950 to 39,610 BCE. If pieces of these three beams were later found by archeologists, they could claim that the site had been occupied for 25,000 years, from about 15,000 to 40,000 BCE. The reality might be that the site was occupied for thirty years from 2095 to 2065 BCE. Assuming that the site was genuinely occupied for several hundred years, we can look at the effects that another tree which started growing in 2100 BCE would have on radiocarbon dates. We will assume that this tree also lived for 250 years before it was cut down. This time, a beam split from heartwood near the outside of the tree, formed in 1860 BCE would have a radiocarbon date of 9,400 BCE. Another beam cut from heartwood formed in 1975 BCE (halfway to the centre of the trunk) would have a radiocarbon date of 11,510 BCE. A final beam split out of the centre of the tree, made of heartwood that had formed in 2090 BCE, would give a radiocarbon date of 14,470 BCE. The beams made from the second tree would give a range of radiocarbon ‘dates’ from 14,470 to 9,400 BCE. Combining the effects of these two trees, we see a site that was actually occupied for 245 years (from 2095 to 1850 BCE) appearing - using conventional radiocarbon dating - to have been occupied for 30,600 years (from 40,000 to 9,400 BCE). This shows the dramatic effect that changes in the C14/C12 ratio could have on radiocarbon dating results. It is difficult, perhaps impossible, to prove that the C14/C12 ratios in the distant past have not undergone variations similar to those proposed here. Logs that show an enormous span of years from one point to another are simply dismissed as contaminated samples. We have demonstrated that there are definitely reasons to doubt the accuracy of the radiocarbon dates that are so widely used to ‘prove’ the age of an artefact. The quotes given above, from authorities working in the radiocarbon dating field, show that even without invoking major changes in the past there are good reasons to be very sceptical about radiocarbon dates. Radiocarbon Dating is useful to compare the relative ages of equivalent samples where it is likely the samples have all been exposed to similar environmental conditions. However, for older samples, the data can only suggest that Sample A is probably older than Sample B, etc. It is merely speculation when the results are used to ‘establish’ an absolute date for older material. Another possibility is that the upper water layer was totally separate from our normal atmosphere and suspended in a similiar manner to orbiting satilites. In this case, it would have still shielded the earth from UV radiation and moderated the climate, but would have had little effect on atmospheric pressure and humidity. The geothermal activity was probably the main source of the rain. During the Flood the earth’s surface was basically levelled. (Note that if the world was level today, there is enough water to cover all the land to a depth of three thousand meters.) Then new mountain ranges and ocean troughs were formed. This unparalleled activity released massive amounts of superheated groundwater and the associated volcanism produced massive amounts of water vapour. This initially condensed to form the rain. As the atmosphere cooled after the water vapour layer collapsed, most of this moisture was carried to the mountain ranges and polar regions where it fell as snow and formed the massive glaciers of the Ice Ages. The MS-DOS computer program used is called RADCARBN.EXE and is available (free) upon request or can be downloaded from our Home page. The biosphere is all the plants and animals living on earth plus the soil, water and air that they occupy. In long-term dating, isotopes of heavy metals such as uranium are usually involved, with decay half lives normally being in the millions of years. This article may be copied freely provided it is copied in full and distributed without charge.